A group of mass media scholars have formed a "Communication Forum" in efforts to make the flow of communications easier and better in society. The Communication Forum was organized participated by a group of liberal-minded media scholars. They included Prof. Lee Chang-Geun of Kwangwoon University, Prof. Gang Jun-Man of Chonnam National University, Prof. Won Yong-Jin of Sogang University, Prof. Cho Heup of Dongguk University, and Prof. Jun Gyu-Chan of Korea National University of Arts. In the first meeting of "Communication Forum," the scholars called for the balanced and free flow of information and idea among the different social groups and individuals. 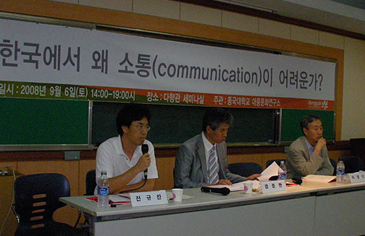 The seminar was held under the theme of "Why Communication Is So Difficult in Korea?" at Dongguk University in Seoul on Sept. 6, 2008. The forum was established amid a severe lack of communications amongst groups and individuals harboring differing thoughts and taking opposing social stands. The seminar was attended by scores of citizens and lasted for five hours. Prof. Won Yong-Jin of Sogang University. Prof. Won is now serving as president of Korea Association for Communication and Information Studies (KACIS). The scholars argued that demand for public discourse have been pouring for free and unbridled thoughts and ideas since the inauguration of Lee Myung-Bak as president earlier this year. "The forum purports to pry open the clogged state of public discourse about political ideology," one scholar was quoted as saying. "One-way communication should be avoided." The forum was organized as President Lee's government was cracking down on social activities of left-leaning groups and individuals. In particular, the peaceful candle-light vigils attended by tends of thousands citizens were cracked down and the leader were hunted down by the police in June and July this year. "President Lee's attempt to communicate with the people is meaningless when the democratic media and discussion are suppressed," another scholar lamented. "It is a poor democracy." They cited as the reasons for the lack of communication such problems as unilateralism by victor, nepotism, too powerful centralism, and privatizing of ideology. The scholars warned against the emergency of right-wing government lacking communication with the people. "The government without proper communication with its people can lead to a totalitarian government," they said. They also pointed to the lack of communication between liberal and conservative media. They called for dialogue between conservatives and liberals, between right and left wings, and between capitalists and employees. 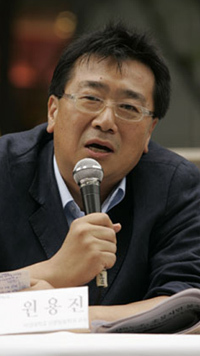 The scholars also proposed a forum with such conservative journalists as Kim Dae-Jung and Cho Gap-Je of Chosun Ilbo, a mass circulation daily which is criticized by liberals for its conservative coverage. Communication Forum's next forum will be on the way of communication between the conservative and liberal media in an era of internet, the fourth estate.